An elegant, soft-set alcoholic sorbet, perfect with fresh berries. 1. Heat the sugar and liquid glucose in a small pan with 3 tbsp water. Stir over a medium heat until completely dissolved and you have a thick syrup. Mix in the elderflower cordial with a pinch of salt and stir over the heat for a few minutes, until combined. Transfer to a large jug and set aside to cool completely (about 1 hour). 2. Whisk the sparkling wine into the syrup until no longer bubbling, then freeze in a pre-chilled container for at least 6 hours, until almost completely frozen. Whizz the mixture in a food processor until smooth, then churn in an ice-cream machine according to manufacturer’s instructions. 3. 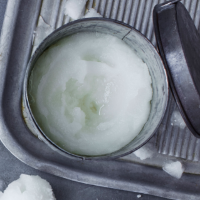 When the mixture is thick and the blade almost stops, return it to the chilled container, cover and freeze for at least 6 hours, or preferably overnight. Serve straight from the freezer, in chilled glasses, with fresh summer berries, if liked.